In the days and weeks after 9/11, Michael Barasch ’80 took to delivering baked lasagna to firehouses around the city. While feeding New York’s Bravest, he observed that almost everyone he visited exhibited a curious “World Trade Center cough.” Many of those women and men later developed cancer or serious breathing ailments from the toxic dust that spread through the air after the Twin Towers fell. Sixteen years later, Barasch’s firm, Barasch McGarry Salzman & Penson, represents 10,000 people affected by maladies caused from breathing in air that the EPA said at the time was safe. Contrary to popular misconceptions, the September 11th Victim Compensation Fund provides aid not just to first responders but also to people who lived, worked, and volunteered south of Canal Street in the days, weeks, and months following the terror attacks. As of October 2017, the World Trade Center Health Program has certified 12,000 survivors who have a 9/11-related illness. Yet more than 300,000 people lived or worked in lower Manhattan. That means that hundreds of thousands of people aren’t aware of the health benefits, nor the possible compensation available to them. What’s really scary, Barasch said, is how many people have been diagnosed with cancer and haven’t connected their diagnosis to the post-9/11 air they breathed. Notably, the WTC Health Program has recognized 68 cancers tied to breathing the toxic dust. “It’s not just a health crisis. It’s a national health crisis,” said Barasch, who added that volunteers from across the country came to New York in the aftermath of 9/11, only to develop health problems years later. Prior to 9/11, Barasch and his then business partner Jim McGarry ’80 represented firefighters injured on the job. Their offices at 11 Park Place closed for a month after the attacks due to lack of electricity. During this time, they visited firehouses to offer food and support. It soon became obvious from firefighters’ breathing issues that New York City could be liable, if the problems persisted, because it failed to provide respiratory protection in accordance with Occupational Safety and Health Administration (OSHA) guidelines. Rather than sue the city, Barasch later brought over 1,000 firefighters to the Victim Compensation Fund after Ken Feinberg, the first special master of the VCF (and 2011 recipient of the Fordham-Stein Prize), waived an eligibility requirement stating that claimants had to go to the doctor or hospital within 72 hours after 9/11. One of Barasch’s clients was a young detective named James Zadroga, who ended up developing pulmonary disease and losing his career. Zadroga later died in 2006; an autopsy showed glass, asbestos, chromium, and benzene in his lungs. 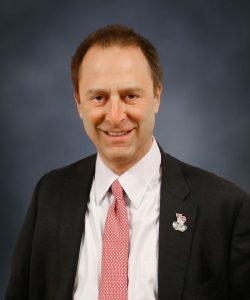 Zadroga would later become the namesake for the James Zadroga 9/11 Health and Compensation Act, passed by Congress in 2010, signed into law by President Obama in January 2011, and then reauthorized in 2015 after an extensive lobbying effort in Washington, D.C., by Barasch, scores of first responders, and “Daily Show” TV host John Stewart. lived or worked below Canal Street for 80 hours between Sept. 11, 2001 and May 30, 2002. People who have a certified 9/11-related condition are also entitled to free health care. “Fordham preached the importance of taking care of people, and I feel like I am doing my part,” he added. Barasch’s work on behalf of the 9/11 community is far from over. While the Zadroga Act extended the WTC Health Program until 2090, the Victim Compensation Fund is set to end Dec. 18, 2020.